Get the best from your warehouse performance – let us help you create the exact racking system you need. Specialised racking can be highly customised, designed and manufactured to fit your specifications. Ask us about designing a specialised racking solution to fit your needs. Choose durable drive in racking where you need high density storage with fewer product lines. Pallets are stored in two or more blocks, usually accessed by one operating aisle. Forklifts drive in to load or retrieve pallets from cantilevered rails. 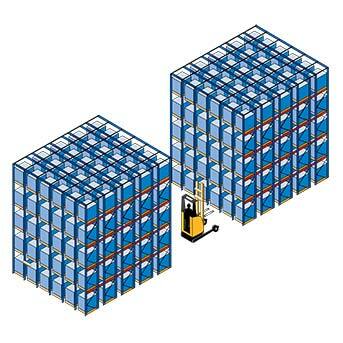 Either configure as a FILO racking solution, or load and retrieve pallets from either side. Gravity flow racking gives you flexible, high density storage with super-efficient FIFO stock flow from the stocking aisle to the picking aisle. Integrate Gravity Flow Racking into automated storage and reveal systems for even greater efficiency. Ideal for perishable inventory, fast moving consumer goods, freezing warehouses, coolstores and food distribution centres. Shuttle pallet racking moves stock via an electric powered shuttle cart on rails, eliminating the need for forklifts and large aisle space. Ideal for businesses with high volumes of only a few SKUs, a shuttle pallet racking system also increases pallet storage density, while streamlining accessibility.